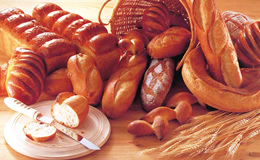 An industrial use refrigeration system has a lifespan of several decades. it must always live up to your expectations. Where is the world heading? 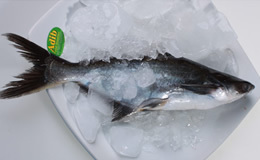 How will the cold chain alter? How will your business develop? to create a part of the future. Ammonia refrigerant, the most thermodynamically efficient refrigerant, is used as a primary refrigerant. 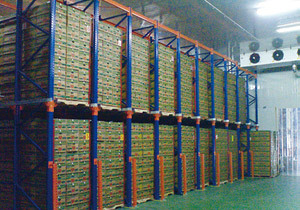 CO2, which is safe, has excellent cooling capability, and a very low transport power is used as the secondary refrigerant supplied to air coolers that keep the inside of cold storage warehouses cold. Ammonia refrigerant can be used across a wide range of temperatures, and is noteworthy for its high level of thermal efficiency. However, it is also poisonous and flammable, making it a difficult medium to handle.  NewTon uses an absolute minimum charge of ammonia refrigerant in a leak-resistant construction. For the CO2 secondary refrigerant, welded joints are used whenever possible to form a sealed structure and prevent leaks. 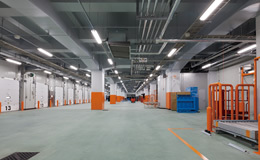 Safety is ensured via CO2 concentration sensors installed in cold storage and work areas to alert workers in case of emergency. NewTon system consists of new design of compressor with IPM motor, optimal design of heat exchanger. In addition the freezing cycle has new idea. 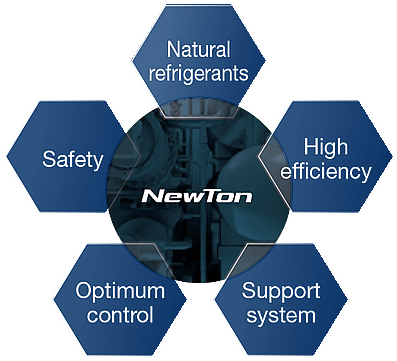 All of the features that make up the NewTon system operate at top efficiency.  This is particularly evident where 60 to 70% of electricity used in cold storage is consumed by cooling equipment. 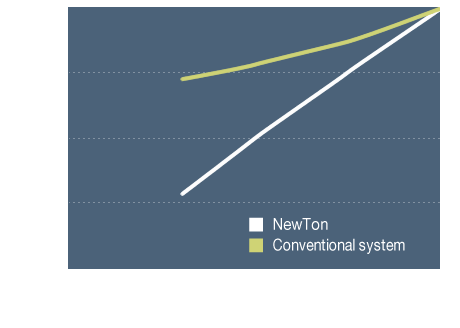 NewTon significantly reduces the amount of power used in cooling equipment, passing on amazing energy efficient benefits to the customer. A design tailored to the specific application is the reason NewTon always provides the best possible performance. Cooling systems require different temperatures, features, and operating times according to the application. 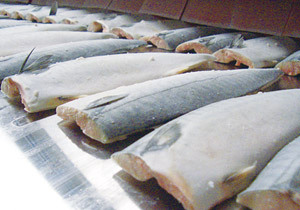 Mayekawa is well-versed in the particulars of nearly every application, including cold storage facilities, ice production, ice rinks, food product freezing and many more. This wealth of experience gives us the ability to customize designs. Even with significant variations in function, or load, the NewTon provides worry free operation. We provide maintenance service that no one else can, with a full menu of options from development to production, sales, installation and service. 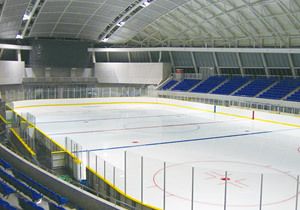 Facilities have a lifespan of a few dozen years. To ensure optimum operating efficiency that is as good as the day the equipment was installed, a remote monitoring network keeps watch over operating status from the plant where it was manufactured. The system identifies abnormal data to help prevent problems before they occur. Attaining high efficiency,designed specifically for each type of use. In order to always operate at high efficiency, we developed specialized models suited to each end use, and came up with appropriate coolants. While consuming little power, they exhibit great capacities. 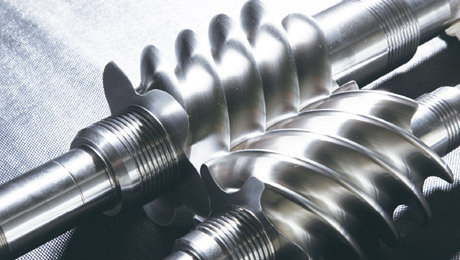 Whether used for storage, ice making, freezing, or in any other field of use, they contribute to energy saving and a reduction in running costs. compressor motor is cut by half. Minimal risk of ammonia leakage. 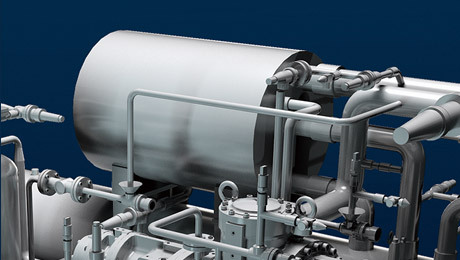 The employment of an indirect cooling method and a high performance heat exchanger minimizes the amount of ammonia used. The ammonia charge of NewTon R-3000 is 25 kgs. and make diagnoses for predictive maintenance. we support the prevention of potential trouble. Peace of mind is the key to higher quality cooling. You want to cool your products in an environmentally friendly way, with peace of mind. We have used ammonia and CO2, natural refrigerants which do not contribute to the destruction of the ozone layer or global warming, and have minimized the risk of ammonia leakage. Moreover, we have installed a remote monitoring system and a predictive maintenance diagnostic system. All this brings an unparalleled level of safety and peace of mind. 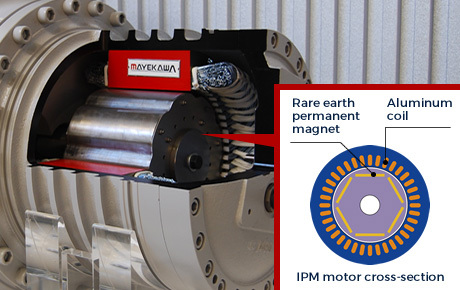 NewTon is equipped with an IPM motor, which contains permanent rare earth magnets inside the rotor. The IPM motor enables high torque operation and the most efficient operation across a wide range of speeds. However, because ammonia refrigerant corrodes copper wiring, a semi-hermetic construction is not feasible. Corrosion is prevented by the use of coiled aluminum wiring. The semi-hermetic IPM motor was developed for use in the ammonia freezer for high-speed, high-efficiency and energy-saving operation. 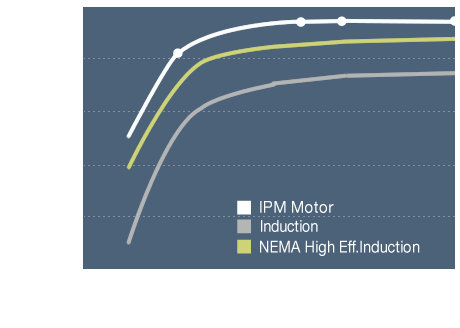 Installation of a synchronous IPM motor reduces power consumption loss. Moreover, an inverter is used to drive the motor, and the speed of revolution is set at 4,500 rpm (5,600 rpm in some cases). Stepless regulation of the speed of revolution by partial loading is included as a standard feature, delivering energy saving. The use of a new profile involving high-level production techniques decreases internal leakage, achieving high efficiency and noise reduction. Not only has this equipment been made more compact, the surface area available for heat exchange has increased compared with the conventional shell and tube model, making heat exchange possible even with small differences in temperature. Enables safer operation and a management control system with less need for manpower to deliver fresh and safe halal food. Significantly reduces maintenance costs. CO2 refrigerant recycling system for enhanced safety. Solves long-standing noise problems. Operates so quietly you must open the door to the machine case to hear it running. Operation status is constantly available in real-time. Maintenance contract improves operation and reduces need for manpower. We offer a broad line-up of NewTon models specifically for different needs and uses. Compared with general-use machines, they are streamlined and efficient, creating an optimal cooling environment. that have long been popular as MYCOM compressors.  Since its establishment in 1924, Mayekawa makes use of thermal technology to expand its business lines into various fields such as the food industry, energy savings and chemical markets. 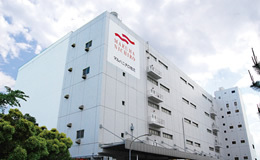 In recent years, Mayekawa has accelerated the development of eco-friendly and highly efficient components and systems using five natural refrigerants “NATURAL FIVE”, NH3, CO2, water, air, and hydrocarbons for the environmental sustainability, protection of the ozone layer and global warming prevention. 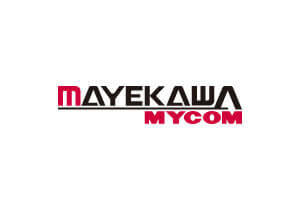 Copyright © 2009 MAYEKAWA MFG. CO., LTD. All Rights Reserved.